To truth is that I would very happily pay to watch Alan Rickman change his socks. So imagine how I felt when Franck and I sat down on the couch the other night to watch a movie about wine starring Alan Rickman. Needless to say, on l’a degusté (there is just no equivalent in English) with exquisite pleasure. Wine. Alan Rickman. France. Alan Rickman. California. Alan Rickman. The legendary blind tasting where Chateau Montelena beat out the French Chardonnays. Alan Rickman. Grapes. Alan Rickman. Go and rent it from your library for concrete proof that frugality can go hand in hand with pleasure, not to mention Alan Rickman. You've seen him in Truly Madly Deeply, right? If not, hie yourself back to the video store and rent it. Watch with a box of Kleenex. Are there any other actors besides Alan Rickman? Le sigh. He was hilarious in Robin Hood: Prince of Thieves (Why would anyone choose Costner over Rickman–get your head examined, Maid Marion!). He has just too much fun acting. It's contagious. He also is very feline–inscrutable, elegant, demanding, and playful. Oh yeah – DEFINITELY add this one to your list. Did you see him in Emma Thompson's Sense and Sensibility? I think it's time I re-rented that one too. ANOTHER one I have to rent again! I think Truly, Madly, Deeply is where I fell in love with him in the first place. 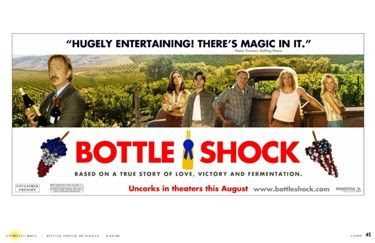 Have you seen Bottle Shock yet? I don't think I've seen that one – I can feel an Alan Rickman festival coming up in my near future. Yay! Glad you liked it. Can you lend it mom and dad now? LOVED it. As Pam would say, *le sigh*. Will give it to Mom & Dad but Mom in bed today with NeoCitran (sp?). She's feeling very sick. But you can't forget the all time best-tongue-in cheek performance of Alan Rickman's "Alexander Dane" in Galaxy Quest, reflections upon which got me through the early phases of labour until the oxytocin was introduced. Not many could carry off that one piece "space suit" plus the plastic cranium decor (which kept coming apart at the seams). God – might have to watch that again.